Too much chicken! That was the thought that entered my mind yesterday when I was thinking about the blog and what’s been cooking here recently. Too much chicken! This is a fact that I am constantly reminded of by my daughter, who puts chicken at the bottom of her list of favorite foods. So, to say the New York strips were a welcome surprise last night at dinner, would be an understatement! I rarely cook red meat, but when I do, I run to the farmers market where they have local meat and pick up a few special steaks. Cooking red meat so infrequently warrants cooking only the best quality cuts of beef, and None Such Farms in Buckingham, PA truly has the best. As delicious as the steaks were, they weren’t the star of the show. 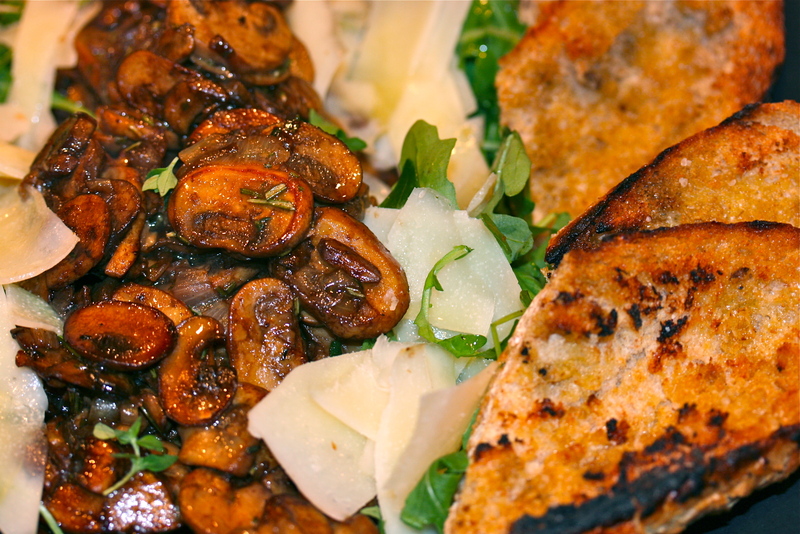 This warm mushroom salad with arugula, and grilled whole grain baguette was unbelievable! 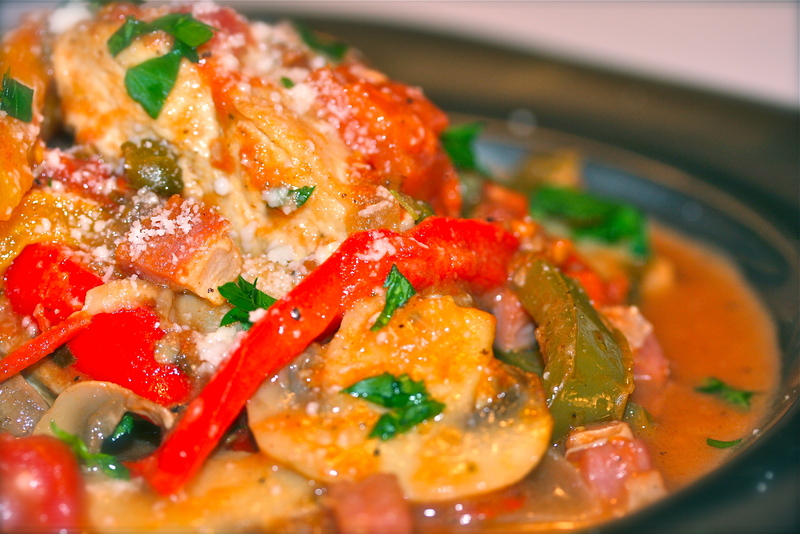 If you love mushrooms, add this to your next menu. 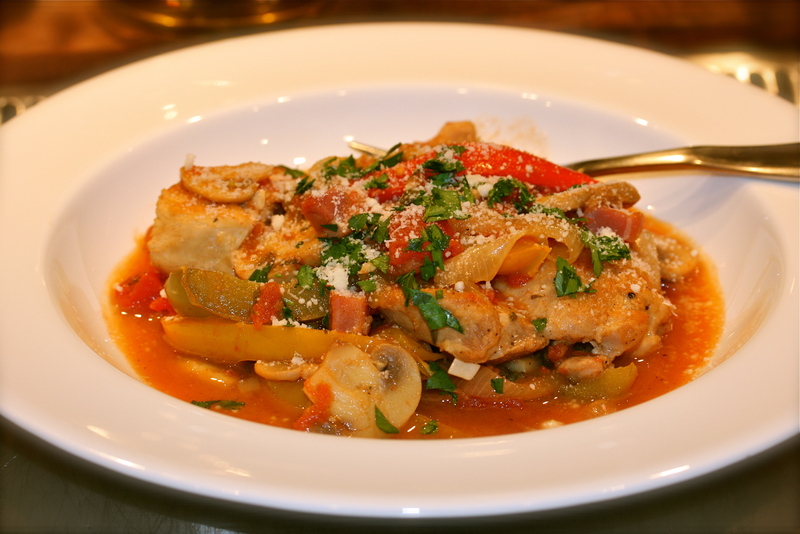 You can serve this as a side, or without the meat as a vegetarian dinner. It looks like a lot of mushrooms when you first put them in the pan, but they shrink down quite a bit as they cook. Heat 2 tbsp of olive oil in a large (12-14″ frypan) over medium heat. Add the sliced onions and cook, stirring frequently until they soften. Add the sliced mushrooms and sauté until their juices release and they begin to turn golden brown. Add some salt and pepper, the fresh herbs and stir. Raise the heat slightly and add the balsamic vinegar and the remaining 3tbsp olive oil. Cook for a couple of minutes, stirring constantly. The vinegar and oil will become the dressing/sauce for the dish. In a large, low serving bowl or a rimmed platter, pour the mushroom mixture over the fresh arugula leaves. The arugula leaves will wilt from the heat of the mushrooms. Sprinkle over the ribbons of fresh Pecorino cheese. 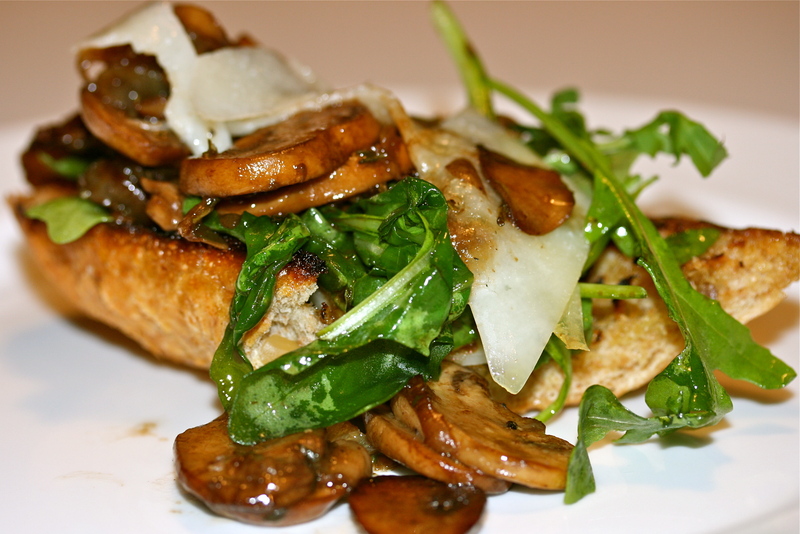 Pile the mushrooms, cheese and arugula over big wedges of grilled bread. YUM! Rub the sliced bread with a little olive oil and sprinkle with coarse salt. Grill for a minute or two until beautiful char marks appear and the bread becomes perfectly crispy.